Trailer Sway – What is it? Trailer Sway is the #1 cause of trailer accidents and the #1 reason most campers give up after only a few seasons and put their new trailer in the classified ads or Craigslist. That’s unfortunate, because it can be avoided. But first, let’s start with some basics: What is trailer sway? Trailer sway occurs when the side forces on the trailer cause the trailer to move side to side behind the tow vehicle. We call it “fishtailing.” Two factors are involved here: (1) the side forces on the travel trailer and (2) the location and type of pivot point that the trailer is linked to. Let’s start with the factor we can’t control: side forces on the trailer. A 30mph wind will produce 2.3 pounds (source: e-how.com) per square foot. If your trailer is 20 feet long by 8 feet tall, that’s 160 square feet. Multiply that by 2.3 lbs. per foot, and you get 368 lbs. of force pushing against the side of your trailer. For a 30 foot trailer, you get 552 lbs. Note that the weight of the trailer is not a factor in this equation. Contrary to popular belief, a lighter trailer does not help with trailer sway problems, nor does a heavy vehicle. Now let’s consider the tow vehicle. A rough estimation for an 18 foot truck by 6 feet tall gives us 108 square feet. Multiplying that by our 2.3 lbs. per square foot, we get 248 lbs of force. The problem here is not necessarily the side force, but the unequal side force. If I link two objects together, then push one object harder than its partner, it will tend to overcome any frictional forces (road/tire, friction hitch, etc.) quicker than the object with less force. Simply stated: the trailer will always be under more side force than the tow vehicle. Even in the best case scenario of a large truck and small trailer, the trailer will have at least a 30% advantage. Your trailer will sway, or pivot, on the ball. It’s all it can do when even a light wind is applied. A traditional sway control hitch can only dampen this trailer sway up to a point. Eventually, the side forces on the trailer will overcome the friction in a sway control hitch. While wind is the travel trailer’s biggest nemesis, there are other factors that cause trailer sway. One near and dear to the RVer’s heart is the passing semi-truck. The “bow wind” of a passing truck pushes the trailer sideways and, to a lesser degree, the vacuum created at the tail end of the truck pulls the trailer back toward it. Essentially, this is the same as wind, but the sudden intensity often catches the RVer by surprise. And, since it hits the travel trailer before the tow-vehicle, it only magnifies the sway condition. Uneven roads that pull a trailer’s tires to the side also contribute to trailer sway. Unfortunately, these are often found in construction zones bordered by concrete barriers that leave little room for error. Even a minor brush against one of these barriers will result in thousands of dollars worth of damage and probably a lost vacation. 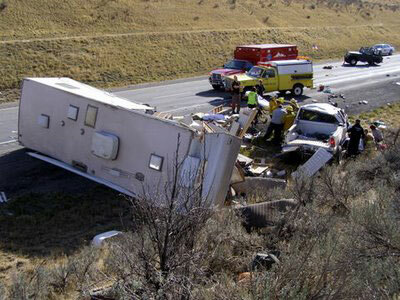 Sudden evasive maneuvers are also a major contributor to trailer sway accidents. Now let’s address the factor that you can control: the linkage system between the tow vehicle and the trailer. Remember when I said that it is the uneven forces between vehicle and trailer that contribute to sway? Well, in order to control sway, we have to even out those forces. Of course, we can’t change the size of the truck or trailer, but we can create a condition in which the two objects appear as one. Picture this: your 18 foot vehicle and 20 foot trailer combine as one 38 foot unit, with no pivot point in between. For those of you who have downloaded our free White Paper, you know that there have been numerous gadgets introduced to the market that attempt to dampen sway through friction. These popular devices (popular because of the low cost) attempt to create the “single unit” concept by adding friction between truck and trailer. In the long run, these will fail. There is simply no way to create enough friction to overcome the huge side forces that will be applied to your trailer. Almost every trailer accident involved a friction sway control hitch. Accidents like this one are the result of trailer sway and are avoidable if you do a little homework prior to buying your next trailer. In fact, you can change the hitch on your current trailer to ensure your safety. To date, the only two towing systems that actually block out the ball and coupler as the pivot point of the trailer and make it impossible for the trailer to sway are the PullRite towing system and Hensley Arrow (or Cub for smaller trailers). They accomplish this by transferring the pivot point of the trailer over the rear axle of the tow vehicle, essentially creating a solid unit from the trailer forward, but leaving the tow vehicle free to turn. The PullRite physically transfers the pivot point forward, but requires a hitch to be permanently mounted to the tow vehicle. The Hensley Hitch mounts to the trailer and is transferable to any trailer you may own. Though more expensive than friction style hitches, it is the only hitch that guarantees the elimination of trailer sway and will remain with you for life. The cost is minor when compared to the cost of trailer accident. For more information on the Hensley Arrow or Cub trailer hitches, click on the video request to the right.